The long wait is over. 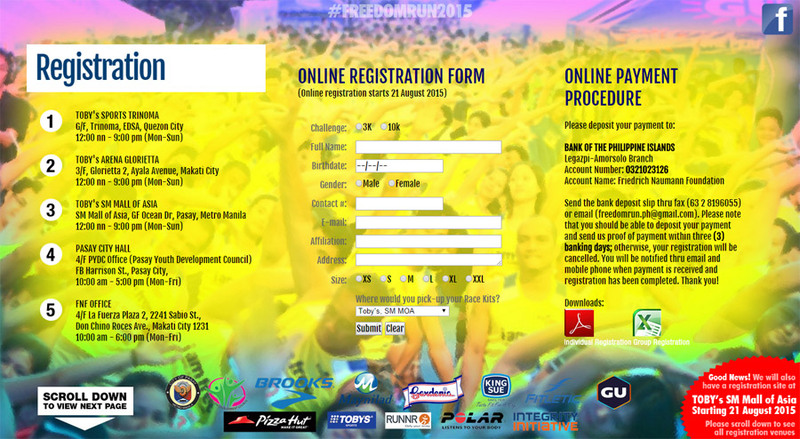 Registration to the Freedom Run 2015 opens to the public on Friday, August 21 until September 13, 2015 or until race kits last. Dubbed as "the biggest race against corruption" in the Philippines, this annual running event with 3K and 10K categories will be held on September 27, 2015 at 5:00 am at the CCP Complex in Pasay City. More than getting a running singlet, a free finisher's shirt will definitely motivate all runners to sprint their way to the finish line! Plus, snacks from the sponsors await each freedom runner in the booths area-- all these for a registration fee of Php500 for both 3K and 10K categories. Special rates apply to groups, students, senior citizens and persons with disabilities (PWDs). Online registration also opens on August 21. 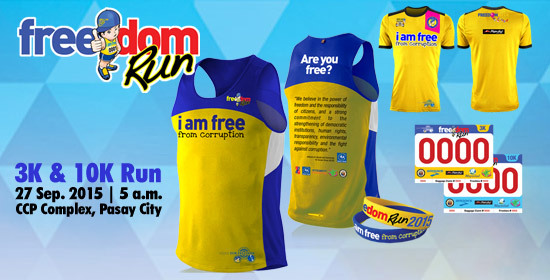 Visit www.freedomrun.ph for the procedures and for complete information about the Freedom Run. For news and updates, visit the Freedom Run Facebook Event Page: www.facebook.com/FNFPhilippines. "We look forward to running with more active and even bigger number of freedom runners this year. The growing popularity of the Freedom Run across the country for the past 5 years is a clear and strong indication that the Philippines is on the right path in its pursuit to be free from corruption," said Mr. Jules Maaten, FNF Philippines Country Director. Five years, nine locations, ten races, 21,644 freedom runners. Through the years, the Freedom Run has become an occasion to innovate and inspire democratic participation in the fight against corruption - gathering public and private sectors, civil society and families. This is part of FNF Philippines "It's All About Freedom Campaign" that translates the complex concept of freedom into everyday language. 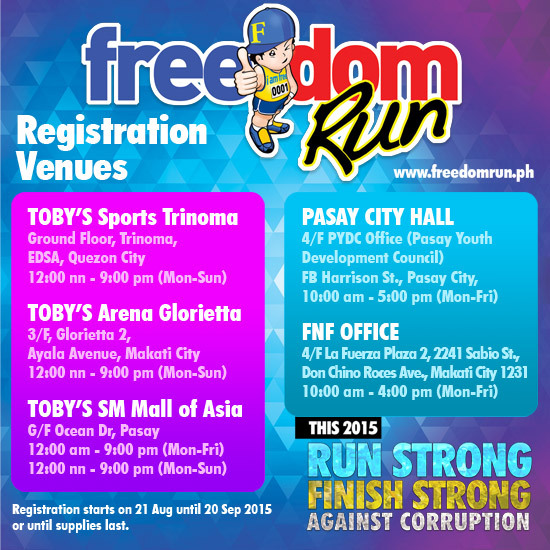 FNF, a German institution promoting good governance, and the Pasay Youth Development Council of the Pasay City Government are the Freedom Run's main organizers. This event is supported by the Integrity Initiative, Inc., European Chamber of Commerce of the Philippines, Pizza Hut, Maynilad, Gardenia, King Sue, Toby's Sports, Brooks, Polar, Fitletic, GU, AktivShow and 1DigiMedia.